I'm out hunting today in the supermarket piesle ('pie aisle'), on the scent for a glorious pie. Imagine my joy when I smell out a reduced Pieminister Free Ranger pie on the shelves. After a quick check on the Pierate blog mobile phone app, I confirm that we have indeed not reviewed this pie before (and after 113 pie reviews even excluding the ones we didn't give a rating, I don't think you can blame me!). I call shotgun and swoop it up into my bear trap before any other hungry pie-hunter-gatherers can get their spears into it. At £3.49 reduced to £2.34, this is a bargain. Let's get the prey home! The box promises "free range chicken, ham hock, leek and cheddar". Let's see whether the pie delivers or whether I've fired a blank here. This is the pie as it is about to come out of the oven. You can see clearly the golden pine colour of the pastry. The condition is great. 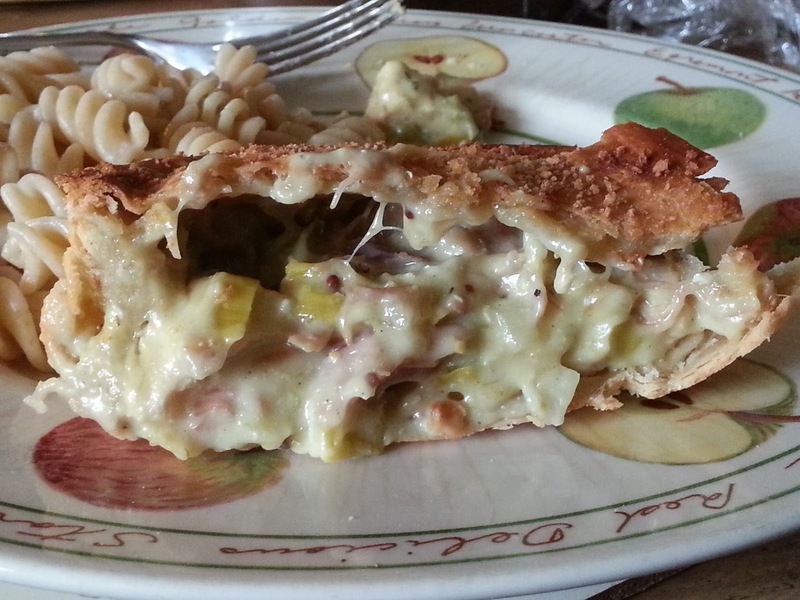 There is a bit of interesting crumbleness on top of the pie there, giving it a rustic and authentic appearance. Like the hungry predator that I am, I encircled my prey planning the best route of attack. I leap in with my forked implement before lacerating the pastry in a dual-pronged attack. The prey immediately succumbs to my wrath, giving way with a lovely cracking sound. 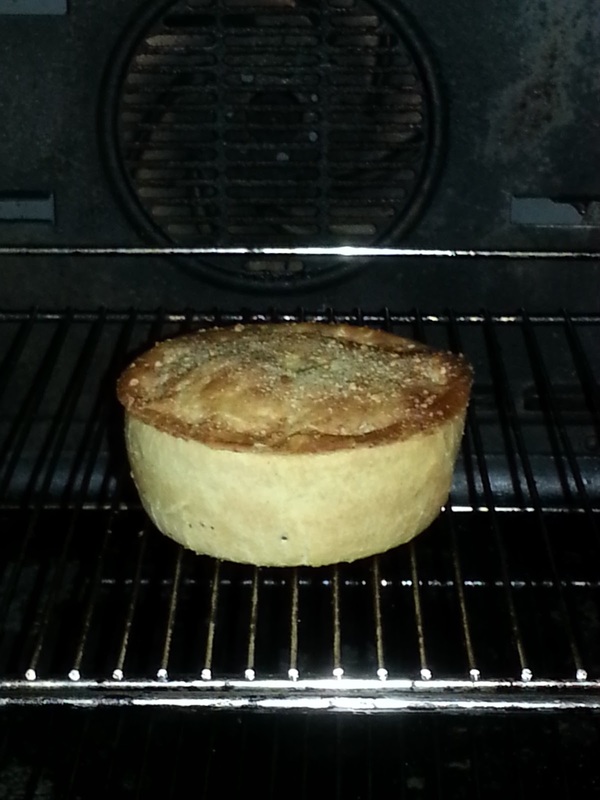 It takes a last gasp before exhaling a dreamy puff of leek-scented steam. In this cross-sectional view of the pie, you can see that the content is good with limited airspace (the photo doesn't quite do it justice, as a bit of the filling had fallen out). The individual ingredients can be clearly seen, rather than just a mishmash of minced product. It looks good and smells good. It also tastes very nice indeed. 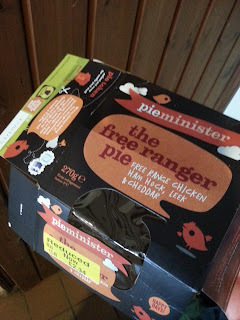 Pieminister have done well here, especially by sourcing free range ingredients. The gravy has a suitable creamy taste and velvety texture. The pastry is crispy and does not taste fatty or feel greasy. This pie feels wholesome, with a good density and wholesome character. There is a good ratio of ingredients, and it is a slightly different combination of fillings (although I have had the same combination of fillings in the past). It's wild and it's delicious. Pieminister haven't really put a foot wrong here.